This wasn’t my idea. It was all hers, my eight-year-old’s, that is. She’s trying to change the world, to make a difference, but in something that is so huge and political and complicated that I wasn’t really sure how to help her at first. How do I encourage her and support her when I don’t even call my Congressman about issues I semi-care about? Because as an adult, I am convinced my call won’t make a difference. But she’s still young enough, idealistic enough, unjaded enough, to believe that writing a letter to a powerful person just might make a difference. 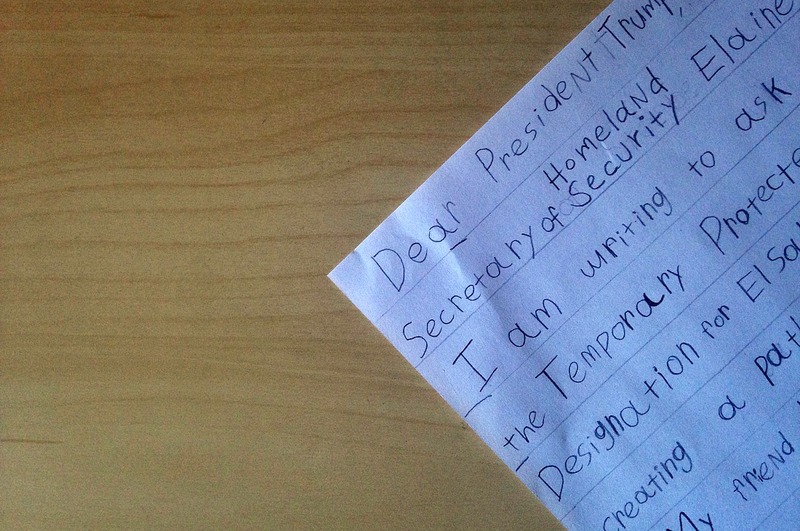 So why is my daughter so compelled to write to the President of the United States? A dear family friend (along with 200,000 other El Salvadorians) is facing almost certain deportation in March of this year. She has lived in the United States since childhood under Temporary Protective Status (TPS) and has been granted temporary residency over and over again for the past eighteen years. She currently works as a bilingual Early Intervention Developmental Specialist, an incredible asset to her community. Her job – the job she acquired after completing years of higher education in America – doesn’t exist in El Salvador. The Department of Homeland Security has already terminated the TPS designation for Haiti and Nicaragua (source). The TPS designation for El Salvador expires in early March, and based on current policy decisions, its renewal is unlikely. If the Temporary Protective Status for El Salvador ends, she will lose her job, her career, and her home. Our friend’s specific plight tugged at my daughter’s heart, and learning that 200,000 other people would also lose their homes, their jobs, and their businesses, stirred her even more*. For adults, it’s really easy for these issues to become just intellectual debates, just heated comment threads, just a hailstorm of ideas about how our country should be run. But all that changes when you know someone personally, someone whose entire life will be turned upside down by these debates and threads and ideas. *See the bottom of the post for how you can help! 1. Respond to their ideas with support and enthusiasm. When your child expresses a desire to do something “kind of crazy”, take a minute to think before you respond. Depending on your personality, your first instinct may be to just smile, nod, applaud the thought, and move on with life, especially if the issue is so big that change seems impossible. I am that parent sometimes. No reminders. No support. No encouragement. I half hope it will go away because actually executing the idea requires a lot of effort on my part. But kids need our support, our reminders, and our encouragement if they are going to grow up believing that they can actually make a difference in the world. When our children are young, they simply can’t act on their crazy big, change the world dreams without you. 2. Prepare them for all possible outcomes. My immediate, unfiltered reaction to big ideas from my kids is usually realistic at best, negative at worst. I am so tempted to say, “Great idea! It probably won’t change anything, but let’s do it anyways.” I don’t want them to be disappointed. That statement, while true, isn’t the best way to support your child’s efforts. It starts with a letter. Children need help researching the issue they want to change. They also need help brainstorming more ideas to take their ideas to the next level. In our case, I needed to find out exactly who to write the letter to and what needs to happen for our friend to be allowed to stay in America. My daughter also needed help with wording her letter, spelling difficult words, copying the letter to send to both President Trump and Secretary of Homeland Security Elaine Duke, and purchasing envelopes and stamps. Finally, we searched for any existing petitions on Change.org that we could sign and share with others. We are still exploring other ways to advocate for our friend. 4. Develop a growth mindset in your kids. The term “growth mindset” was coined by Dr. Carol Dweck. 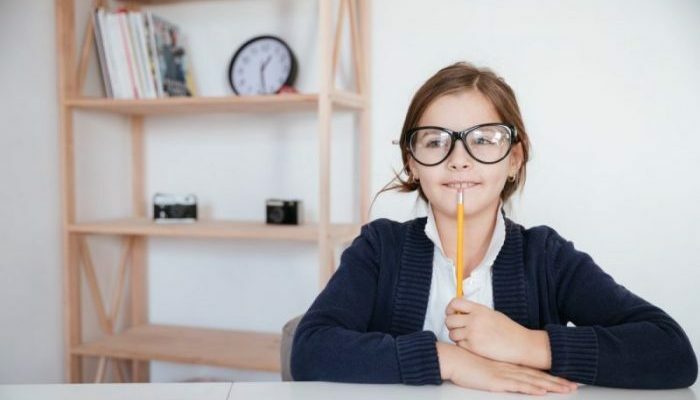 After years of studying students’ attitudes towards failure, she and her colleagues found that “when students believe they can get smarter, they understand that effort makes them stronger. Therefore, they put in extra time and effort, and that leads to higher achievement” (source). One way to help kids develop a growth mindset is by reading stories about people who overcame failures and setbacks and went on to achieve great things. Visit the children’s non-fiction section of your local library to find biographies written specifically for kids. I recommend starting with the series “Ordinary People Change the World” by Brian Meltzer. These books show kids that people who did extraordinary things started out as very ordinary people. These ordinary people lived their lives, dreamed big, experienced failure, and refused to give up. 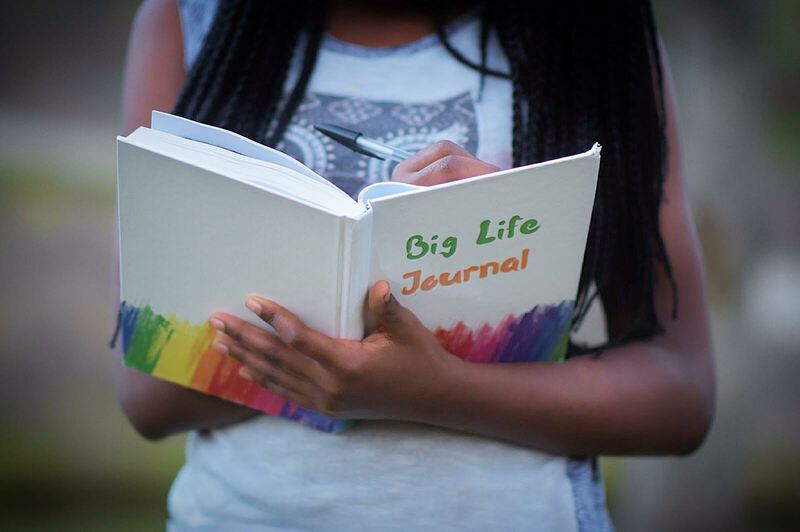 Another great resource to develop a growth mindset in kids is the Big Life Journal. The first of its kind, this journal uses thought-provoking questions, creative conversation starters, and inspiring stories to help you develop growth mindset in your kids. 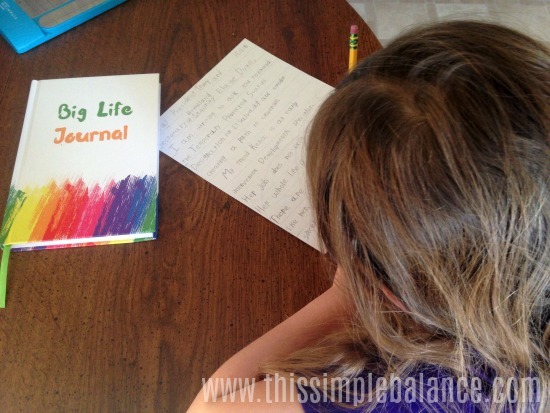 The journal is designed to be completed with a parent or another adult (a “Journal Buddy”). We have loved the weeks we have completed so far! One of my favorite things about parenthood is experiencing the world through the eyes of our children. They remind us that sometimes things don’t have to be as complicated as adults make them out to be. Sometimes, it really is as simple as writing a letter and putting it in the mail. One simple action can be the start of something so much bigger. What if we really believed that as adults? What if every person performed an intentional act of kindness every day? What if the power of social media was harnessed for good instead of hate? As adults, we understand how big the world really is…and how has that helped us? We so often downplay the role that one person can play in the world. That knowledge stops up from picking up the phone, writing the letter, giving a few dollars, sharing a post or petition on social media. Sometimes, knowledge limits us instead of pushing us to do more. We weigh the odds and think, “How likely is it that this one, small action will really make a difference?” It takes so little time or effort, but so many of us skip it. Maybe that’s why we don’t see the changes we want to see in the world. A child’s desire to make a difference became a letter. Now it’s a blog post. Maybe tomorrow because of our efforts, the Secretary of State will decide to extend TPS status for El Salvadorans and provide a clear path to citizenship for the 200,000 affected people. But I do know that this eight-year-old of mine, she’s inspired me. She heard one person’s story and decided to actually do something about it, even if it doesn’t change anything at all. In fact, right now she doesn’t seem too worried about her efforts failing. She was just determined to do something. She wanted to write one letter really well so that the people who need to see it do see it, and pay attention to it. And isn’t that how all change starts? One person doing one seemingly small thing. 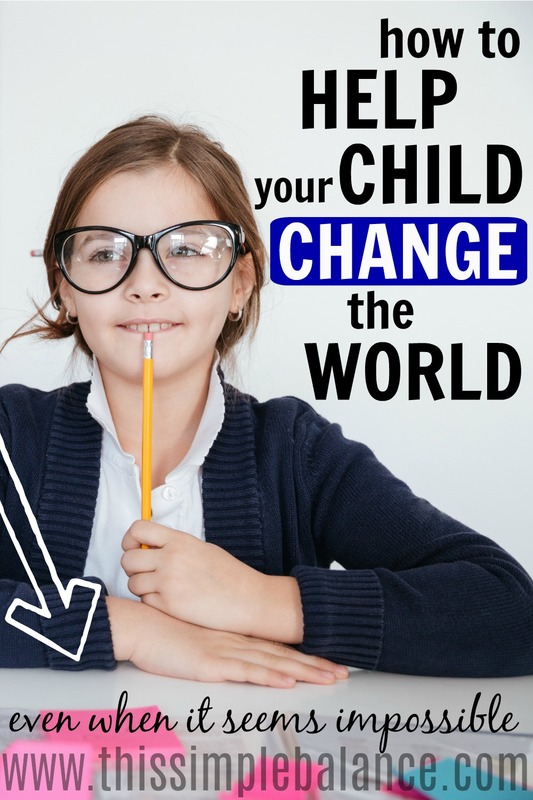 Can a child change the world? I hope against hope that she can.